Perfeito para as suas férias em família, casamento ou reunião! TahoeTarns está localizado fora da cidade de South Lake Tahoe. Não há multas de estacionamento de US $ 2.000 em TahoeTarns! 2.400 metros quadrados, deck de 500 metros quadrados com banheira de hidromassagem embutida, acomoda confortavelmente 14 pessoas. Aquecimento central a gás natural, garagem fechada para 2 carros c / entrada ao nível da rua, estacionamento adicional na rua para pelo menos 3 carros, grande trenó ao lado da casa durante o inverno! Uma curta caminhada (2-5 minutos) para o lago e Zephyr Cove Resort (praia pública mais popular de Tahoe, M. S. Dixie II navio de cruzeiro e aluguer de embarcações). Apenas 4 milhas ao norte de casinos jogos South Lake Tahoe (Harrah, Horizon, Hard Rock, Harvey), a 15 minutos da área de esqui Heavenly, 1 milha de Wally Huddle (um favorito para cerveja e pizza), e 1/2 milha a sul de Zephyr Cove Park (biblioteca, quadras de tênis iluminadas, áreas para piquenique e cursos de ginástica). Plenty of National Forest trilhas na área para caminhadas, ciclismo e esqui cross-country. "Nossa missão é proporcionar um lar maravilhoso para suas férias e superar suas expectativas de valor e qualidade. Se fizermos isso, você vai desfrutar de sua estadia em Lake Tahoe e vai voltar novamente. Isso é importante para nós, porque os clientes repetidos são nossos melhores clientes. "- Maria & Bob Tarn, alugando nossa casa de férias para os visitantes de Tahoe desde junho de 1994. Nós somos um Pet Free & Smoke Free Home, por favor. Aluguer de férias no Condado de Douglas, Nevada # 05-060 e # DP18-0317. 3 casas de banho completas, com banheiras e chuveiros. Quarto familiar com mobiliário confortável e mesa de bilhar de tamanho júnior. 'Centro de negócios' no andar de cima tem mesa, lâmpada, Ethernet HP OfficeJet 4500 impressora / fax / scanner / copiadora e alguns suprimentos de papelaria. Casa tem aquecimento central a gás natural. Localizado em Zephyr Cove, e apenas a 05/02 minutos a pé da Zephyr Cove Resort Beach. 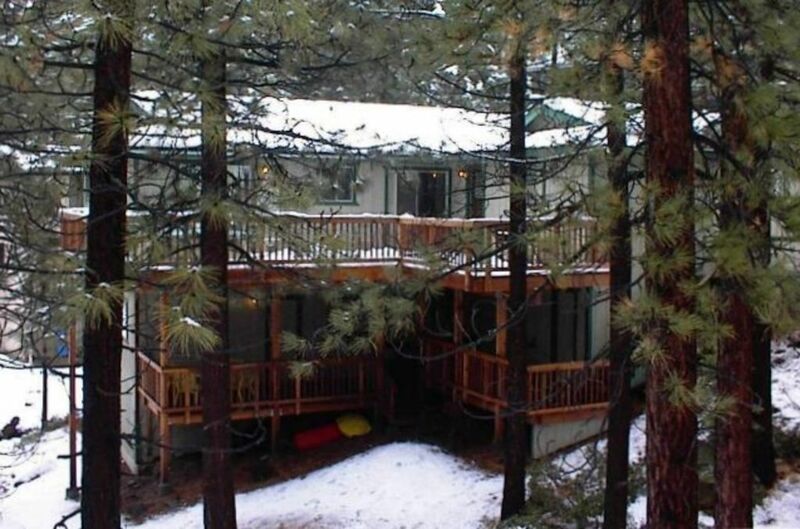 The house accommodates a fairly large group comfortably, was conveniently located very near the casinos of South Lake Tahoe, and was reasonably priced even with the VRBO fee. Although the wifi was out (modem shorted out due to blackouts) and the hottub wouldn't heat up (later determined to be an issue with the igniter), which was disappointing, Maria returned our calls regarding the issues right away and immediately offered to discount our fee without prompting. The only issue to be aware of (at least during the winter) is that it is situated on a hill that was just steep enough that even the AWD vehicles had trouble making it up with the snow on the ground. Glad you enjoyed your stay. Internet is up and running again as is the hot tub. First time using VRBO, and we are so happy we did! This house was AMAZING! It had everything we needed and then some! We go to Tahoe annually and always stay in hotels. After staying here, we hope that we can continue the tradition at this house, it was perfect! The Tarns were very responsive, easy to get a hold of when needed and provided excellent info for locating the house. We had a large group, and everyone had their own spot to sleep comfortably! With all the children we had in our group, the snow was easily accessed from the lower deck, without having to drive anywhere. Thank you for letting us into your home, we hope to stay again! Place was clean and nice. Wish the hot tub was newer but everything worked perfectly. Comfy home with a family vibe. No modern fancy expensive décor but the home is cozy, clean and welcoming. The three TVs with cable and Netflix worked great. Everything was in working order including the Wi-Fi. We didn't use the hot tub so I can't comment on that. There are five queen beds. One of them was a bit firm but okay if you have back issues. The other four were soft and comfortable. The two bunks and sofas were so soft and comfortable. More than enough towels, linens were clean. We are a family of 12, ages 50 years old to 6 years old. We had more than enough space. I was a bit worried about the parking and neighbors because I've heard such bad stories about Tahoe parking/noise fines and neighbors that don't like renters, but we had no problems. There was enough room for five cars. We parked our sixth car across the highway at Zephyr's Cove beach. It was free to park while we were there but the attendant told us it's $10/day during high season. You can hear the highway from the deck but it isn't loud and didn't bother us. I know some are sensitive to noise so that could be an issue for others. If you're looking for a family accommodating house that is safe, cozy and clean I'd recommend you stay here. We hope to be back. Thanks for the honest review. I always like to tell people it is a large cabin which is very comfortable for a large group. We are on the Nevada side of South Lake Tahoe (Douglas County) and while they do have guidelines they are common sense guidelines which allow all, including families to enjoy beautiful Lake Tahoe. Thanks again for booking and feedback! Banho de sol nas proximidades, Lake Cruises, e Gaming. O restaurante Zephyr Cove Resort, armazém geral e loja de presentes estão abertos durante todo o ano. No verão, o bar à beira-mar, loja de roupa de banho, aluguer de embarcações, e parapente atração estão abertas. O resort inclui um MILE DE SANDY BEACH. Um parque público rústico é uma meia milha da casa, com quadras de tênis iluminadas, campo de softbol, ​​playground, áreas para piquenique e cursos de fitness. 3-night minimum for Summer Season and certain holidays if booking more than 2 months in advance. $300 refundable security deposit is required to reserve your dates ($500 for New Year). Rent and cleaning fee is due 60 days before date of entry. Douglas County, Nevada, Vacation Rental Permit DP18-0317.